Portal is a great video game. Full of comedic value and interesting puzzles. Okay, game review over. 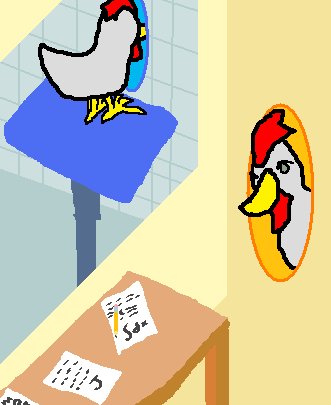 This chicken used a portal to reach the observation room linked to his testing chamber. While he saw white a bit of paperwork there didn't seem to be anyone around. Some of these things seemed like they were half filled out with some scrawling on them. Whoever had been in charge of it clearly hadn't done a very good job. The gray chicken had worked very hard to get to this place he wasn't supposed to and couldn't help but being disappointed in the result. This= win. I love Portal! Was the chicken doing calculus or were his observers... we shall never know. Awesome blog, was linked from hyperbole and a half.